The continued excellence of the University Libraries depends on increased levels of giving from alumni, friends, corporations and foundations. Donors to the Libraries have the ability to ensure continued academic and intellectual excellence for the entire University and will help the Libraries achieve its vision of inspiring scholarship, creativity and innovative learning. Gifts, regardless of their size, allow the University of Miami Libraries to enhance and preserve valuable collections, provide the highest quality research assistance, and create inviting spaces for learning and study. To discuss annual giving opportunities, leadership commitments, a special project or collection, please contact the director of library development at 305-284-4026. 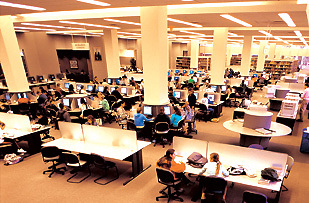 The University of Miami Libraries are poised for far-reaching expansions. From a new grand reading room, to enhanced reference and learning areas, the new Library Center will serve as the catalyst to help transform the University into a leading research institution. The University of Miami Libraries offers a unique opportunity to pay lasting tribute to a significant person in your life, or honor a loved one through a donation to the Libraries via the Honor with Books Program. The Friends play a vital role in supporting programs, securing gifts, and funding projects for the Libraries and are instrumental in ensuring the University of Miami remains one of the foremost research institutions in the world. The Progress Report highlights the Libraries’ recent endeavors and demonstrates how we are fulfilling our mission to preserve, expand, and disseminate knowledge in support of the University’s academic goals.